Whenever I wonder if I should be more actively involved in politics, I look at Jimmy Carter and know I shouldn't. Carter has spent a generation telling us truths we didn't want to hear, and paying the price for it. He was far ahead of his time when he was elected -- although few knew that -- and remains so today. He is still telling us hard truths we don't want to admit. Iraq is America's greatest blunder. Israel is practicing a form of Apartheid in the occupied territories. Who will ever forget his "cardigan sweater" speech in the 1970s telling Americans to conserve fuel and seek alternatives to oil? How many millions of people would not have died horrible deaths in war had we listened to him? The fact is we didn't. The fact is we still don't. 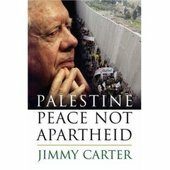 Coverage of Carter's latest book Palestine: Peace Not Apartheid has drawn minimal coverage from the U.S. media. Europeans are far more interested. But they can do far less than we can. Then there's the savaging Carter has taken from the right. His views are called "obsessive hatred of Israel" (they are not) and one caller to C-Span (above) called him "a racist and an anti-Semite" and got huge applause from the right wing amen corner. I was struck by just how relevant, and just how far ahead of us all, Carter remains, 26 years after leaving office. The environmental crisis now enveloping the world (think the hurricane threat isn't real -- go to the Phillipines), the ethnic and religious hatreds that continue to bedevil us, the huge and growing gap between the ultra-rich and the ultra-poor (which the poor fight by destroying the ecosystem), the essential difference between right and wrong, these are still motivating him to stay involved, at age 82. In many ways Jimmy Carter is the most relevant man of our time, far more relevant than either Bush or Clinton, because he asks the hard questions, and our responses are a litmus test of our own character. Here is what I mean. What I consider more significant here than the right-wing hatred of Jimmy Carter is the silence I see concerning him from people who consider themselves liberal. The usual suspects in Left Blogistan have hardly written a word about his new book, about his appearance on Meet the Press, or about the C-Span insults. Even Juan Cole, normally one of the bravest men I know concerning the Arab World, has kept his mouth shut. Jimmy Carter is a test of what we are as people, and most Americans are still failing. Until we address the subjects he is addressing -- address them seriously -- we can't make progress against our real problems. Jimmy Carter is still ahead of his time, and we're running out of it.